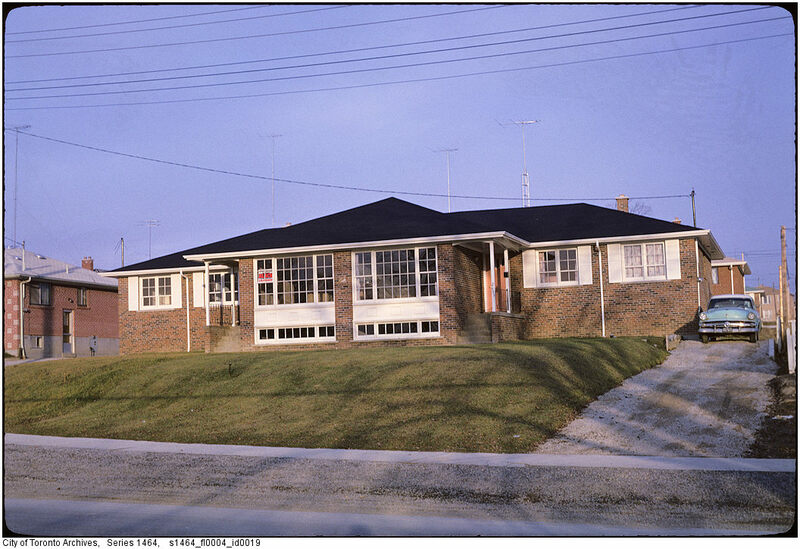 1960s Etobicoke Housing. Source: City of Toronto Archives. Canada has been and continues to be a suburban nation. Yet, Canadian environmental history has not fully explored this rich potential area of research. According to David Gordon, director of the School of Urban and Regional Planning at Queen’s University, “More than two-thirds of the nation’s population (22.5 million) lived in some form of suburban neighbourhood in 2011,” and in the Greater Toronto Area “more than 86 per cent of the population live in a suburban neighbourhood.” Between 2006 and 2011, Canada’s low-density suburbs saw the highest rate of growth with some metropolitan areas experiencing low or no growth in core neighbourhoods. In all 33 Census Metropolitan Areas in Canada, more than 80% of the population lives in low-density suburbs. A 2013 study by David Gordon and Mark Janzen calls for a reclassification of “urban” in demographic and planning research. They argue that suburban planning requires a different set of techniques and strategies and therefore a classification system for suburbs is necessary to better understand the needs of Canadian urban dwellers. They divide suburbs into three classifications based on a combination of density and transportation characteristics: exurbs (low density rural areas with high automobile use; more than 50% employment in city core), auto suburbs (almost all residents commute by automobile), and transit suburbs (high proportion of transit commuters). They defined “active core” areas as census tracts where more than half the residents commute by walking or cycling. The extraordinary growth of Canada’s suburbs pose numerous challenges for urban planners. Low-density automobile-dependent suburbs tend not to support economic, social, and environmental sustainability. Jennifer Keesmaat, Chief Planner of Toronto, recently wrote in Globe and Mail that “For municipalities feeling the fiscal crunch, low-density development is proving to be extravagant.” Supplying necessary urban services to low-density suburbs is expensive. Calgary Mayor Naheed Nenshi recently called for an end to “sprawl subsidies,” the various tax breaks, infrastructure support, and other public policies that facilitate suburban sprawl. There seems to be an opportunity for Canadian environmental historians to explore suburban environments of the post-WW2 period. Given that a majority of Canadians now live in suburbs, a historical study of changing human-nature relations in these environments would yield important insights. We chose this theme for the 2014 Canadian History and Environment Summer School both to take advantage of our location at York University and to bring attention to the vast potential of suburban environmental history for future scholarship. We hope that this event will help stimulate new ideas, generate debate, and potentially lead to new research on Canada’s suburbs. David L. A. Gordon and Mark Janzen, “Suburban Nation? Estimating the Size of Canada’s Suburban Population” Journal of Architectural and Planning Research 30, no. 3 (Autumn 2013): 209. Environmental Health Committee, Ontario College of Family Physicians, Report on Public Health and Urban Sprawl in Ontario: A Review of Pertinent Literature (2005), 39. Nancy Hofmann, Giuseppe Filoso and Mike Schofield, “The Loss of Dependable Agricultural Land in Canada” Rural and Small Town Canada Analysis Bulletin 6, no. 1 (January 2005): 1. Ontario College of Family Physicians. The Health Impacts of Urban Sprawl: Volume I, Air Pollution (2005), 3. Richard Harris, Creeping Conformity: How Canada Became Suburban (Toronto: University of Toronto Press, 2004); John Sewell, The Shape of the Suburbs: Understanding Toronto’s Sprawl (Toronto: University of Toronto Press, 2009). Adam Rome, Bulldozer in the Countryside: Suburban Sprawl and the Rise of American Environmentalism (New York: Cambridge University Press, 2001); Christopher C. Sellers, Crabgrass Crucible: Suburban Nature and the Rise of Environmentalism in Twentieth-Century America (Chapel Hill: University of North Carolina Press, 2012); Sandberg, L. Anders, Gerda R. Wekerle, and Liette Gilbert. The Oak Ridges Moraine Battles: Development, Sprawl, and Nature Conservation in the Toronto Region (Toronto: University of Toronto Press, 2013). I found this analysis interesting and find that using commuting methods as a way of differentiating suburban neighbourhoods a useful analytical framework. The links on health problems with suburbia were interesting and refer very specifically to the types of suburbs present in the 21st century (and clearly focusing on the GTA and National Capital Regions). However, suburbs did not emerge fully formed as they currently are and I was wondering whether the comparative situation were the same in the 1910s, 1930s or 1960s, when commutes were somewhat shorter, Canadian children had fewer cars and the urban cores were more polluted. How did these trends evolve historically and relate to to larger trends in urban geography? You raise a very important point. The contemporary analysis of the social, economic, and environmental sustainability of suburbs changes over time. Early twentieth century Canadians living in street car suburbs might have experienced improved health effects by living further away from point sources of air pollution in city centres. The arguments about sustainability, however, are often directed at what Richard Harris refers to as corporate suburbs of the post-WW2 period. The main point that you raise still stands. Social, economic, and environmental conditions of suburbs are historically contingent. All the more reason for Canadian environmental historians to take a look. You may be interested in this recent EconTalk podcast. The guest, who is a road engineer, has some interesting things to say about the history of road design in the United States. Thanks for sharing this very relevant resource. Sewell makes a very similar point in his book, Shape of the Suburbs. Taking the TTC as an example, he finds that the TTC became less profitable and eventually ran an structural operating deficit as it shifted from an urban public transit system to a suburban commuter transit system. Stretching its lines to outlying, low-density suburbs was costly and the new suburban neighbourhoods did not have the ridership to recuperate those costs.